Balance mutual funds are like balance diet for investment it provides best of both world, safety and capital appreciation. A balance mutual funds is recommended for risk averse investor looking for stability and income generation. A balance mutual fund is also known as hybrid funds. What is balance mutual funds? The mutual funds are classified based on investment patterns. The fund which invest their money in equity, as well as a debt instrument, is known as balance mutual funds. The fund which invest their money in equity is known as equity mutual funds. The fund which invest their money in debt is known as debt mutual funds. 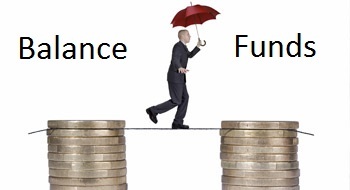 Usually, two types of balance funds are available under balance fund. (1) Equity oriented and (2) Debt oriented hybrid funds. Equity Oriented – Equity oriented mutual funds invest 60% money in equity based instrument and remaining 40% money in debt instruments. Debt Oriented Hybrid Funds – Debt Oriented mutual funds invest 60% money in debt based instrument and remaining 40% in equity instruments. Let’s look at Top 5 Best Balance Mutual Funds. All these funds are equity oriented balance mutual funds. Balance fund investment provides inherent diversification as an investment is done in both equity and debt instruments. Balance mutual funds are comparatively safe and low risk as certain portion of the money is invested in debt instruments. These funds are less volatile as a downturn in the market affects this fund very less. Balance mutual funds help to rebalance your portfolio. Balance mutual funds are best for the first time investor as it is risk averse. One can select balance mutual funds for critical financial goals like retirement planning, kids education etc. How to select good balance mutual funds? Risk Tolerance – First thing you need to know is risk tolerance level. Based on your risk profile you can select equity oriented or debt oriented hybrid mutual fund. Expense Ratio – Lower expense ratio means a good fund for investment. You should evaluate fund on the low expense ratio. You will able to get information about expense ratio from the website or respective funds. Investment Patten – You can further study a type of investment being done by these mutual funds. You can easily get this information online. Past Returns – Past performance is one more indicator for the selection of right mutual funds for the selection. You should at least see performance history of last 5 years. Mutual Fund Type – Balance mutual fund is type Debt or Equity. It is advisable to select equity-based mutual funds for higher returns. Fund Manager – You should ideally look for detail about fund manager, who is managing this fund and he is capable enough or not. Balance mutual funds are one of the best investment options which give peace or mind and balance in asset allocation. So, what are you waiting for? Invest in best balance mutual funds and enjoy the benefits. Have you invested in any of Balance Mutual Funds mentioned above? Do you think balance mutual fund is good for investment? Do share your query and views in comment section. I have recently got 4 lacs through PF from my ex employer, I want your help in investing this amount.. I am looking at a long term investment- If you can suggest some good mutual funds or Stocks that i can buy. You can invest in mutual funds like UTI Top 100, SBI Magnum Mid Cap fund, HDFC balance Fund.For stock market investment i suggest to do proper study and invest based on your risk profile.